Discussion in 'Deer Hunting' started by Homebrewer, Nov 5, 2018. Cavity Back 120gr MKZ over 35.3 gr ARComp, BR-4 primer, 2.290" oal, converted Lapua 6.5x47 brass... 2903 fps. Nov 3rd, opening day TX whitetail season. Watching 7 different bucks from an old 6 point cull up to three 10 point bucks. None of the bunch would qualify for my lease single trophy tag, though one of the 10's should be a solid contender at trophy status next year. The morning best buck has 10 tall tines, but narrow spread and no beam mass - yet. I have lots of video of this buck. Also got to enjoy watching two groups of corn buzzards - Turkey. Bailed from my blind and back to camp for breakfast about 1030am. Goofed off midday - leveling my 5th wheel RV and removed the bounce from the unsupported RV ground pads. Solid and perfectly level now. 430pm head back to my blind for the evening hunt. The same seven bucks from morning, and four does come and go at the feeder. The bucks are already chasing two of the does, so things are getting interesting. Had a bigger buck step out of the creek tree line, scent checking for does - 10-15 seconds and he was gone back in the trees. I wanted to see this buck again. Around 530pm had a sounder of hogs come running on a string, straight to the feeder. One large sow, and about 10 smaller pigs. All the deer leave the premises when hogs hit the feeder. Well - bird in the hand - lined up on the sow, squeezed the trigger and the 120gr MKZ at 2903fps - turned her lights Off. Looks like about 220lbs, and ready to drop another litter. The trigger puller attempted a second shot on a runner disappearing in the mesquite - and Failed. Dammit. OK,, I'm supposed to be Deer hunting, so maybe that was a mistake. Around 630pm, the 10-15 second sighting buck from earlier, is showing up between the mesquite on the far side of the feeder. 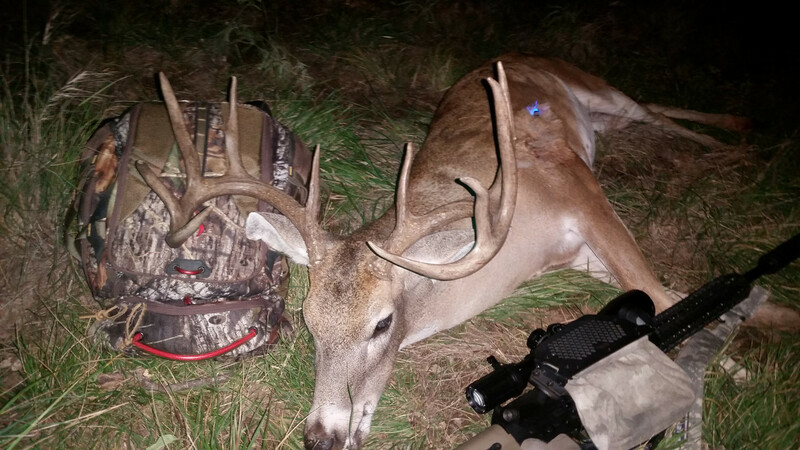 Get the 270AR on the buck, and crank up the SWFA SS 5-20x scope to checkout his headgear. Looks like a shooter to me. This buck is still spooked with the dead sow at the feeder, and approach toward the feeder is slow-stop-slow-stop.. 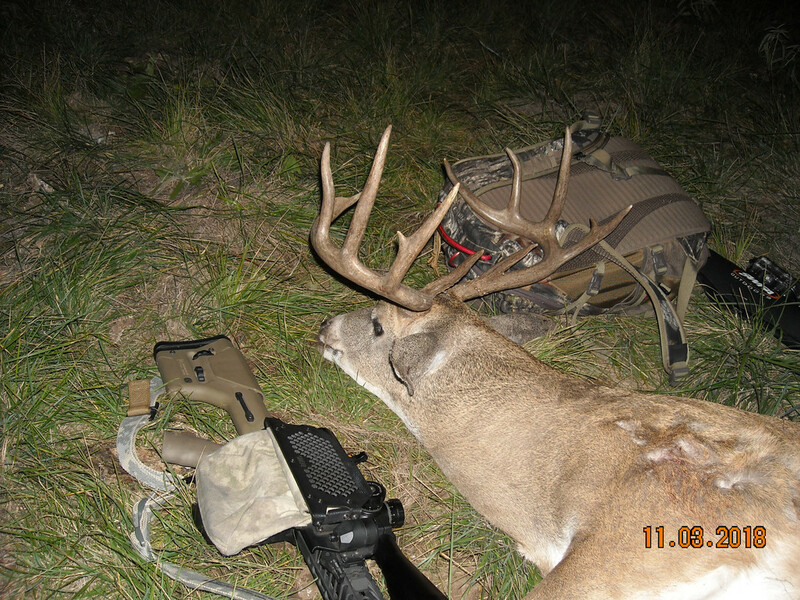 Finally on the last stop, he cleared the brush and mesquite, safety off, trigger squeeze and my *** 270AR drilled him. desmond, der Teufel, slim_shady and 5 others like this. Nice buck Dennis!! And, a producing factory shut down too... bonus points!! Nice work there Kemosabe. That’s an awesome buck! Good work. Looks like you are cheating on your TAC 30. Real nice deer! And a good hog too. Sounds like a good hunt! Good Shooting! Appreciate that RD. Made a screaming run to my taxidermist next morning with the Buck, and skull from my Sus boar. One of the guys on my lease commented I probably killed 12 hogs - with One bullet! lol. 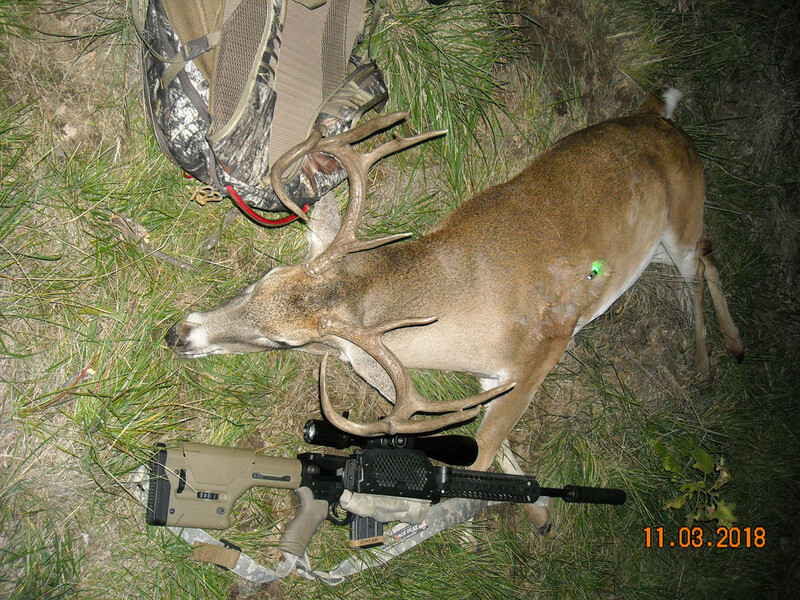 Chopper - Yessir, I really liked the buck as well.. 10pt main frame with extra kickers on both G2 points. I plan to head back to the lease tomorrow with both TAC 30's, Day light build & thermal build. Looking for a cull buck, and night time sounders.. Appreciate the props J-K. Finished cut/wrap and the buck is in the freezer. Taxidermist has the front end of him, should be complete end of March. Thanks CoonDog. Sweet - was walking up on that buck! 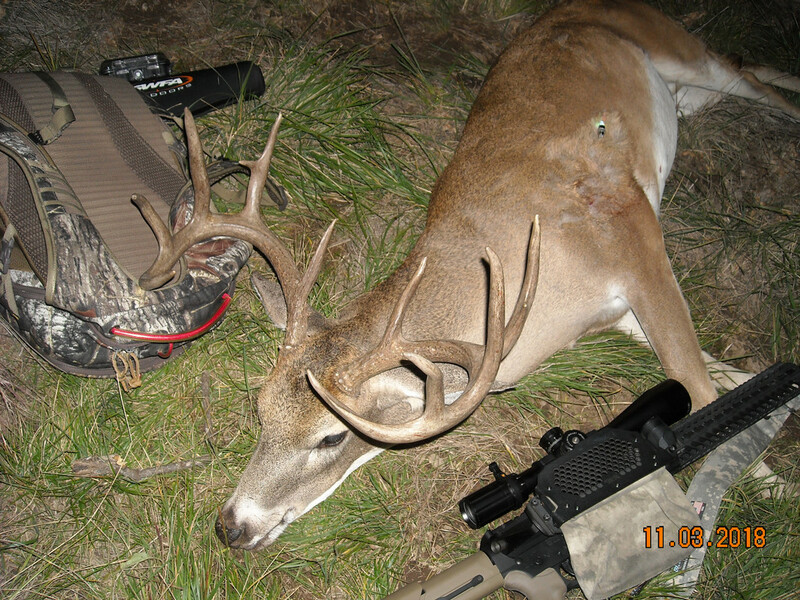 Good detailed narrative – I don’t know much about whitetail hunting and found it informative. A lot of shooters think all you have to do on a lease is write a check and show up for opening day. Shooting a hog is never a mistake (unless you were aiming at a politician and missed). how did that score? beautiful rack love seeing dead deer. oh do i miss the midwest. a shooter buck on the lease here in fl looks like a large dog who got a few tongue depressors stuck on his head. LOL, just now looking at the pictures again and I see the little firefly lights for marking downed animals for later recovery. Nice. Nice buck! Not that I'm a deer hunter, but it looks to be a lot better than average, I think. Shoot I'm just looking back again and admiring that rack if you measure those G2 kickers you might have a 12 pt. I think they have to be 1" to officially count we use the 'if you can put a ring on it' rule. Great buck Red! Very solid! Nice deer and hog!